Home Guest Editorials Protect your body from cancer and free radical damage! Watercress is the perfect powerhouse vegetable to protect you from free radical damage! Anyone who is serious about their nutrition and cancer protection has probably heard about the importance of eating leafy green vegetables or making sure that they are eating from the rainbow! The question often comes up as to which vegetables are the best? All vegetables are better than processed foods but it is true that some vegetables offer more lifesaving benefits than others. Watercress ranks #1 with a perfect score of 100 on William Paterson University’s list of “41 Powerhouse Fruits and Vegetables” list! Hippocrates established a hospital close to a stream to ensure that patient would receive watercress daily! Watercress is a great source of vitamin K, providing 312 percent of recommended daily value. Vitamin K helps strengthen bones, and protects against neuronal damage in the brain. The plant also proved 72 percent daily value of vitamin C and 64 percent daily value of vitamin A.
Watercress contains anticancer compound and stops cancer development! Eating watercress daily found to increase ability to resist free radical damage to DNA! 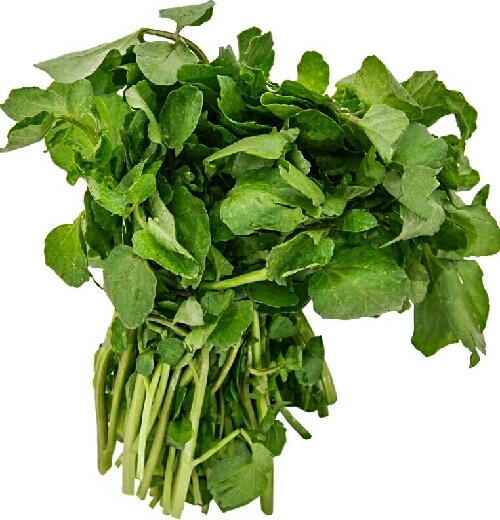 Watercress is highly versatile and can be used in salads, soups, and risottos. If you juice or make smoothies daily, throw a handful of water cress through your juicer or in your blender. It has a subtle peppery flavor and can also be used as a garnish to your favorite dish! If you are not currently purchasing watercress on a regular basis, consider adding this item to your weekly grocery list. A daily portion will help your body fight free radical damage. Equality, Freedom & Raw Food — Your Natural Rights!